Free checking that really is FREE! Glendale Area Schools Credit Union offers access to over 28,000 free ATMs. That’s 10,000 more ATM’s than available at the largest bank! Let us help you switch to a Glendale Area Schools Credit Union FREE Checking Account today! NEW! ATM Partnership with Walgreens Expands Free Statewide ATM Network! Starting November 1, 2011, Glendale Area Schools Credit Union Members can access ATMs free of service charges to withdraw cash and check account balances at more than 560 Walgreens stores throughout California—many which are open 24-hours. Switch To Glendale Area Schools Credit Union And Save! Open your account by completing our online Membership application. Once your Membership has been established, you are eligible to open (or apply for) additional services such as a Glendale Area Schools Credit Union Checking Account including low interest rate loans and low to no fee credit card! Use a voided check to set-up deposits of paychecks, retirement, and pension checks, or Social Security checks directly to your account. When switching over to Glendale Area Schools Credit Union checking account, don’t forget to notify anyone who makes automatic withdrawals from your old/previous account, such as mortgage companies, insurance providers, utility, phone, or cable companies. To find the account numbers for your checking account, look at the bottom of your checks for a series of numbers. (click the image below to enlarge). For automated withdrawals or deposits to a savings account, use this same account number and indicate "savings" and it will post to your savings account. 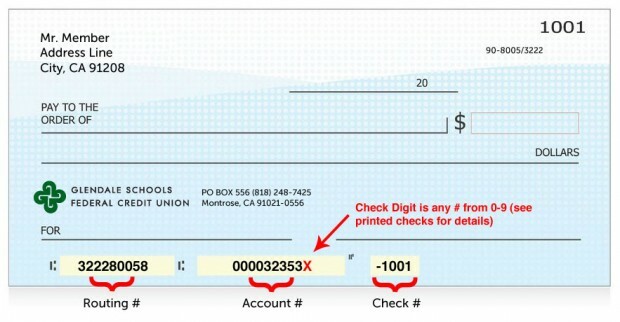 Your Check Digit can be located by reviewing a printed check from your checking account. This is a unique digit that is special to each checking account not located on your membership ID card. If you do not have printed checks, simply call us and we can assist you. When switching to Glendale Area Schools Credit Union, verify that all automatic transactions have been switched to your new account and all outstanding checks have cleared your old account, ask your previous financial institution to send you the balance from that account. Don’t forget to destroy your old checks, ATM/Debit cards, and deposit slips. If you have any questions during the process of opening your Glendale Area Schools Credit Union account or switching your checking or savings accounts, contact us. An Extra Level of Protection for your Accounts. Overdraft protection acts as a safety net on those occasions when you have insufficient funds to pay for a transaction. Instead of an item or transaction being returned or declined, it may be paid using one of Glendale Area Schools Credit Union overdraft options. Glendale Area Schools Credit Union offers two types of services to protect you from experiencing an overdraft when you have insufficient funds. Both options, using your Glendale Area Schools Credit Union VISA line of credit and Courtesy Pay, are based on what’s in your best interest and are your choice. We’ll ask you how you want overdrafts handled and you’ll need to opt in to receive these extra levels of protection. Apply for your credit card today. Or contact us for more information. Bonus Checking is here – Get 1.75% APY! Have a monthly Direct Deposit to your credit union savings or checking account. Sign up to receive e-Statements monthly- electronic statements. An email address is required to notify you of each available statement that is access online through home banking. Use your Debit Card (ATM/Debit) or VISA Credit Card a minimum of 12 times per month. Transactions at an ATM do not qualify. -Dividends will be paid monthly on balance up to $25,000.